1.Preheat oven to 325°. In small bowl, toss parsnips with 1-1/2 teaspoons oil and a pinch of salt. In separate small bowl, toss beets with 1-1/2 teaspoons oil and a pinch of salt. 2.Line rimmed baking pan with parchment paper or aluminum foil. Transfer parsnips and beets to opposite sides of prepared pan in single layer. Roast vegetables 10 to 15 minutes or just until tender; cool. 3.Meanwhile, in small skillet, cook pine nuts over medium-low heat 4 to 5 minutes or until toasted and fragrant, stirring frequently; transfer to plate to cool. 4.Segment the orange by slicing off top and bottom ends to make 2 flat surfaces. Place orange, cut side down, on cutting board. With small paring knife, slice down the sides following the natural curve of the orange to completely remove skin and white pith. Holding orange over small bowl, with paring knife, cut on either side of the membranes to release each segment. 5.In blender, purée avocado, water, lime juice and a pinch of salt until smooth. Makes about 1/4 cup. 6.In medium bowl, whisk together yogurt and remaining 1 tablespoon oil. Add kale, vegetables and a pinch of salt and toss to combine. 7.To serve, with back of spoon, smear 1/4 of the avocado mixture onto each of 4 salad plates; evenly divide vegetable mixture over avocado mixture. 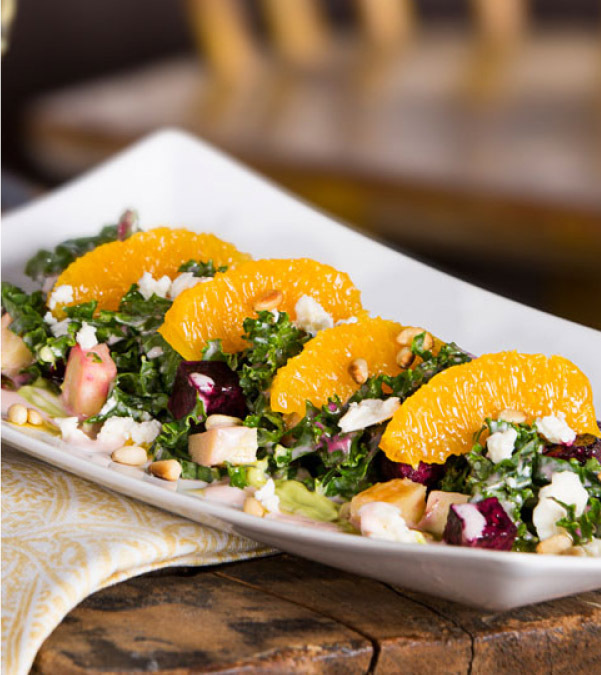 Sprinkle each salad with 1-1/2 teaspoons pine nuts, 1 tablespoon cheese and orange segments.